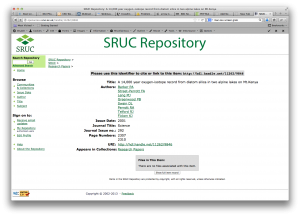 Scotland’s Rural College (SRUC) is the latest Scottish Digital Library Consortium (SDLC) partner to use our services to host their institutional repository. The SRUC are based at King’s Buildings, but have sites all over Scotland, and this repository hosts all of their research papers, which centre on all aspects of agriculture and rural issues. Currently they have opted against attaching PDFs of their papers to their records, but for the most part, Digital Object Identifiers (DOIs) are available, to summarise the research. The repository is the first to be released using the DSpace 3.1 infrastructure, and, while this doesn’t look markedly different to our other repositories, there is improved functionality available for OAI_PMH (harvesting), batch import for various bibliographic formats, and statistics (based on Solr indexing). The URL for the new repository is openaccess.sruc.ac.uk. Let us know what you think! Thanks to Theo Andrew for guidance on data mapping, and for assisting in training the SRUC staff. Thanks also to Jarlath Flynn, Heather Shirra and Rachel Atkinson from SRUC for their assistance in getting everything implemented. ← How do I get hold of the book I need?